This week we shift our focus to European gas demand. We aim to set out why European demand growth will be even more important than Asian LNG demand in driving the evolution of both European hub prices and LNG spot prices over the remainder of this decade. Last week we explored the impact of weaker Chinese LNG demand on European hub prices. We set out a scenario that illustrated the impact of European hubs having to absorb higher volumes of flexible LNG as the global balancing market. This week we shift our focus to European gas demand. We aim to set out why European demand growth will be even more important than Asian LNG demand in driving the evolution of both European hub prices and spot LNG prices over the remainder of this decade. In the last 5 years gas demand across Europe has fallen by a staggering 19%. This equates to a 109 bcm reduction in annual demand from 585 bcm in 2010 to 476 bcm in 2014 (based on the IEA’s definition of Europe’s 32 gas consuming countries). Putting this 5 year reduction in European demand in the context of the LNG market, 109 bcm represents more than 40% of total current annual Asian LNG demand. Approximately half of the fall in demand over the last 5 years occurred in 2014 alone (52 bcm), the result of exceptionally warm weather, e.g. Germany’s weather was the warmest in recorded history. Of these 3 factors, the power sector (1.) has been by far the largest contributor to the overall reduction in gas demand (once weather influences are accounted for). The fall in demand has been induced both by gas vs coal plant switching (given relatively weak coal prices) and by an increase in renewable output across Europe. Looking forward, it is important to note the impact of extreme weather in 2014. Industry forecasters have been consistently overly optimistic in predicting a recovery in European gas demand. But it is reasonable to expect a significant demand recovery in 2015 regardless, given normalisation of the weather effects of 2014. This may also be supported by somewhat higher gas plant load factors as the result of weaker gas hub prices. 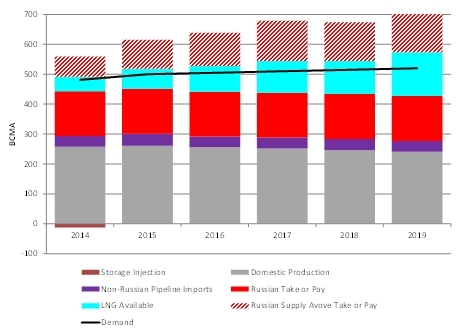 We combine this European demand scenario with an assumption that Asian LNG demand growth continues at a reasonably robust rate (18% CAGR), again as we assumed in the original LNG market scenario we set out in April. It is useful to contrast this chart with the one we showed last week. In the weak Chinese LNG demand growth scenario from last week, Europe only really started to struggle to absorb surplus flexible LNG from 2019. The tipping point (where pipeline contract flex is exhausted), is reached much earlier in a weak European gas demand scenario. This comes down to the scale of European gas demand relative to Asian LNG imports. Asian demand growth is impressive, but it is coming off a much lower base. The point of the scenario analysis above is not try and forecast a weak demand outcome. Instead we are trying to illustrate that weak demand adds to the challenges Europe is already facing in absorbing growing surplus global volumes of LNG over the remainder of this decade. Over the last two weeks we have looked at the impact of (i) weaker Asian LNG demand and (ii) weaker European demand on the European gas market balance. Of these two, European demand is the bigger driver. But a combination of the two in parallel would cause a larger and more rapid development of surplus gas at European hubs. The risk of this happening and the resulting impact on hub price dynamics means we are keeping a close eye on the tipping point framework we set out recently as new liquefaction capacity comes to market.